Brooklyn is a terrific place to shop. It's a very different experience from both Manhattan's SoHo or Fifth Avenue, and in a different league from suburban shopping. As it's not always obvious where to go for what kinds of things—and Brooklyn's always changing—here's a quick run-down of places to look for specific types of shopping experiences. Half the fun of Brooklyn is exploring the neighborhoods. Walk around some neighborhoods and explore the little stores! In general, the best bets are Carroll Gardens/Cobble Hill, Fort Greene, Park Slope, Prospect Heights, and Williamsburg. But Brooklyn's a big place, and one can find interesting shopping in many other neighborhoods, including wonderful nuggets such as Irish stores in Bay Ridge and immigrant-run food shops along Ocean Avenue. If you're looking for vintage, the best two places to hunt are in various shops in Williamsburg (check out the best vintage in Williamsburg, and the moveable market, Brooklyn Flea, a very popular market with lovely, but not cheap, vintage goods). Brooklyn doesn't have a fine antique neighborhood, as some cities do. Check out the furniture stores on Atlantic Avenue for some antique shops on the stretch between Smith and Nevins. For Macy's, Best Buy, Target, Aeropostale, Victoria's Secret, and other national brands, head to the conveniently located Atlantic Center and other Brooklyn malls. All offer a good selection of mid-priced stores and discount chains stores, too. New York is a walking town; everyone wears sneakers. Shoppers will find trendy sneaker shops aplenty at all malls, with urban trendsetting sneakers showing up early at Fulton Mall. For hipster sneakers, head to Williamsburg. IKEA in the waterfront neighborhood of Red Hook is a huge attraction and can be reached by bus, car, or ferry from Manhattan. The new City Point shopping center in Downtown Brooklyn has a Target, a Century 21, and a sprawling underground food hall called DeKalb Market. Brooklyn enjoys a lively market scene. 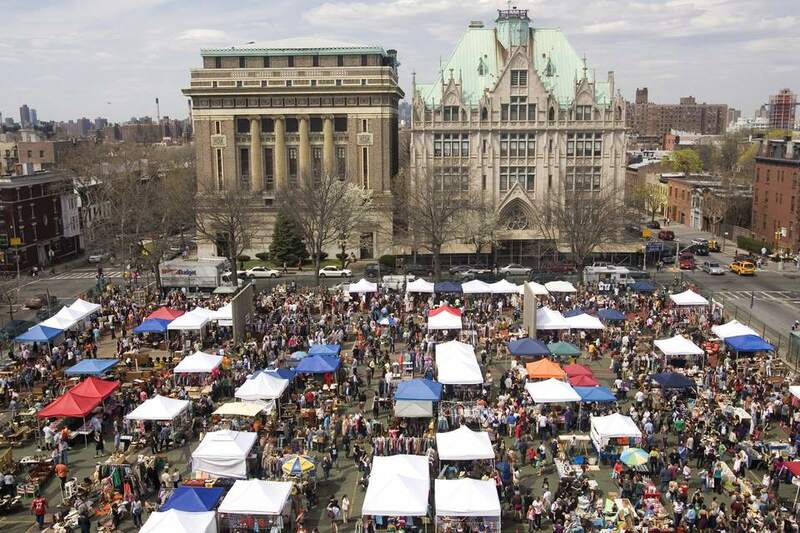 Every week, Brooklyn Flea offers both curated vintage and second-hand goods, as well as excellent farm-to-table food. An innovative outdoor market featuring vendors selling their wares from inside huge painted shipping containers, is open daily except for January through early April. A few weekly flea markets round out the options. The single best time of year to enjoy Brooklyn's market scene is in the month of December when Brooklyn's many holiday markets spring up in schools, concert halls, and plazas. But May is also a good market month, with DUMBO's Shop the Archway festival and one of several annual art shows by the Brooklyn Waterfront Artists' Coalition. The BAM Dance Africa in Fort Greene—an African marketplace held at the Brooklyn Academy of Music—draws thousands of visitors. Finally, the famous outdoor Brooklyn Book Festival, an annual weekend event with a market feel, is a testament to Brooklyn's lively culture of writers and readers. For ladies clothing, children's boutiques, and tasteful home furnishings check out Fifth Avenue in Park Slope, and Smith or Court Streets in Carroll Gardens. Head to Bedford and Grand Avenues in Williamsburg for hipster clothes and a general aesthetic. For equally hip clothes, some with African imported materials, walk up Fulton Street in Fort Greene. Inexpensive children's gear and adult clothing are readily available on Fifth Avenue in Sunset Park, a Latino working class neighborhood. For a range of well-priced, untrendy, conservative clothing—and women's hats, wigs, long coats, children's dressy clothing, kids gear and shoes—and anything kosher, take a trip to the orthodox Jewish neighborhood of Borough Park (but don't go late on Friday afternoon or Saturday, when everything is closed). Brooklyn is home to Etsy, the popular online market, and many neighborhood stores sell unique, handmade or designed clothing, gift items, jewelry, and household items from pottery to pillows, created by artists and artisans in the Etsy network. Good neighborhoods to look for stores carrying such items are Williamsburg, Carroll Gardens, Cobble Hill, Park Slope, and Prospect Heights. The annual Waterfront Artists Coalition and galleries in Bushwick and DUMBO are wonderful places to see the work of local sculptors, painters, and artists. For ethnic food, don't miss the tiny stretch of Atlantic Avenue off Clinton Street that's long been a center for Middle Eastern foods (notably Sahadi's emporium), or Brighton Beach Avenue for authentic Russian foods (notably M&I supermarket). Manhattan Avenue in Greenpoint is a good place to get some Polish kielbasa and bread. Italian food is available everywhere in Brooklyn, but some excellent old meat markets, bread and pastry shops still dot 13th Avenue and the environs of Dkyer Heights and Bensonhurst. Brooklyn still has vestiges of the borough's original Irish and Norwegian immigrants in food stores in Bay Ridge. Pockets of Coney Island Avenue are home to ethnically authentic Pakistani and halal stores, and Caribbean fare can be found throughout Flatbush. There are ethnic restaurants as well, from Irish to African restaurants, serving specialties from home. Other specialty food shops include chocolatiers in DUMBO, Park Slope, and Williamsburg, several famous bakeries from Steve's Key Lime Pie to Baked cupcakes in Red Hook, Gowanus and Williamsburg, and numerous organic meat and food markets in Park Slope and Williamsburg. As for bagels and pizza, one could write a book.